Nazri (right) with Pairin (second left) and Yusop (left) taking photograph with two Bobolians in front of the Oath Stone. 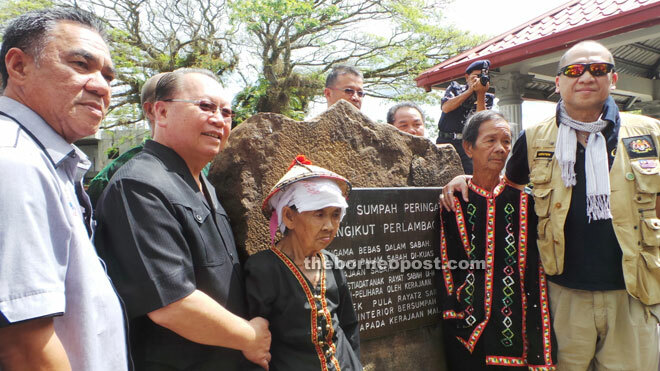 KENINGAU: Tourism and Culture Minister Datuk Seri Mohamed Nazri Abdul Aziz said the Oath Stone here would be gazetted as a National Heritage Site. He said the Oath Stone would be gazetted as a heritage object under Section 49 of the National Heritage Act 2005 based on its importance and significance in Sabah’s history, especially in the formation of Malaysia. “The Oath Stone is indeed important in Malaysia’s history. So, it is only right that it should be gazetted. Starting today, we will start the process to make the Oath Stone a national heritage,” he told reporters in a press conference after the Keningau District Officer Haji Yusof Haji Osman briefed him on the Oagth Stone here yesterday. The Oath Stone was erected in front of Keningau District Office here in the 1960s, as a historical monument that served to assure the Sabahans that their rights to religious freedom, land, culture and customs were guaranteed and would continue to be protected by the Federal Government after Sabah became a part of Malaysia. “Personally, I want to put it to rest and I think the Oath Stone does not rest,” he said. He also wondered how the Oath Stone plaque that contains the original wording got lost. Nazri said as the Tourism Minister, the issue of Oath Stone was important to him because he is the minister responsible for anything that is considered as a national heritage. “So I’ve come along with my senior officials and also I give assurance on fulfilling my decision to reinstate the word ‘Kerajaan Malaysia Jamin’ in this Oath Stone. “The decision I made today need to be followed up by my officials and make sure it is implemented,” he said. “About the Oath Stone removal, my ministry will follow only what is decided by the people of the state through the state government. We want to put it to rest once and for all. I ask if it can be speeded up. We want to carry out the ritual with bobolian (high priestess) and I will be present when it is placed at the new site. “I will bring the application for RM15 million to the Prime Minister who is also the Minister of Finance. I hope that my fellow ministers such as Minister in the Prime Minister’s Department Tan Sri Joseph Kurup and other state ministers will support me, “he said. He hoped that it would remain in place forever. “And I also expect the state government through Deputy Chief Minister Tan Sri Joseph Pairin Kitingan and the state cabinet to support this so that this request will approved by the Federal Finance Minister. Commenting further, Nazri said the state government through the Sabah Museum Department had agreed to gazette the Oath Stone under the State Cultural Heritage (Conservation) Enactment 1997. “The ministry, through the National Heritage Department, will provide consultancy in the aspects of preservation and conservation, as well as protection of the Oath Stone, especially during the relocation process and the reinscription of the text on the plaque. “As such, we are hoping to get the support and cooperation from the state government in the effort to protect the heritage object, building and site,” he added. It was reported that the Keningau District Office had agreed to relocate the stone to a new site near the Keningau Heritage Museum, to enable visits from local and foreign tourists, hence turn it into another tourism product for the district. Earlier, Nazri also visited the Oath Stone and the proposed new site for the stone near the Keningau Heritage Museum building. Also present were Tambunan District Officer Thomas Logijin, Tenom District Officer Madiyem Layapan and District Chief OKK Mohd Amir Datuk Arif.